One of the most interesting stories in history is how the Roman Republic became the dominant power in the Mediterranean basin over a period of about a century and a half. Rome never had a set policy of conquest. Due to the political structure of the state it would have been inconceivable for the Roman elite to concoct a long term foreign policy strategy spanning over a century. So, if Rome’s extensive conquests were not part of a deliberate policy, how did they occur? I am a proponent of the defensive imperialism school of thought. The basic idea is that Rome faced a series of foreign policy events in which they felt a threat to their vital interests. Some threats were due to invasions, others were unintended consequences due to Rome’s meddling in the affairs of other states. Each successful war that extinguished a particular perceived threat led to new problems involving new peoples progressively more distant from the city of Rome. Also, each successful war added either new territory or a new client state, thus expanding the republic. One day, the Romans woke up and realized that they had conquered the Mediterranean basin. This post is the first of a series of posts that will briefly outline the main events in Rome’s conquests via defensive imperialism. Let us begin with the events leading up to the invasion of Italy by Pyrrhus, King of Epirus (one of my favorite historical figures) in 279 BC. At this time, Rome had just emerged as the victor of the Third Samnite War (298 – 290). This victory resulted in Rome becoming the dominant power in Italy from the Po Arno River to the city states of Magna Graecia in southern part of the peninsula. The Samite wars were the culmination of a bitter struggle, over a half century, between the Romans and a constellation of Italian tribes and the Gauls. Due to Rome’s central position in the Italian peninsula, there were no natural and easily defensible boundaries south of the Po. Also, since groups in the ancient world were rarely able to live in peace for any appreciable length of time, warfare to dominate Italy was inevitable. For any of the various Italian states, the ultimate foreign policy objective to ensure safety inevitably led to the conquest of the entire peninsula south of the Po. We can see that Rome was able to accomplish the first part of this task via its successful conclusion of the Third Samnite War. The end of the war did not mean that hostilities ceased in Italy. There was continued fighting between the Romans and the Gauls with some mop up operations against the Etruscans. In 282, as part of mopping up operations in the south, the Romans defeated the Lucanians. The advent of a Roman army so far south alarmed the Greek city states of southern Italy, one of which, Tarentum, responded by attacking a Roman fleet. Thus began the series of events that eventually let to the conquest of southern Italy by the Romans. 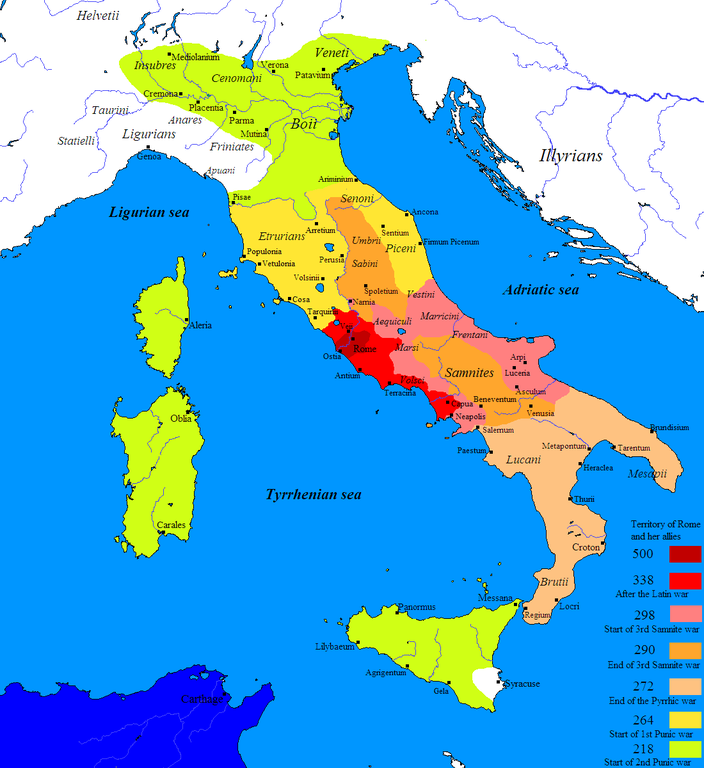 What is ironic about the alarm of the Greeks of southern Italy, due to Rome’s conquest of Samnium, is that they had repeatedly been alarmed by the Samnites in previous decades. This led them to appeal to Greece for military aid. The most recent event occurred in 334 when Alexander of Molossis was able to relieve the pressure on the Greeks, despite being assassinated during the campaign. When the Romans eliminated the Samnite threat in 290, the Greeks appeared to be in a favorable position. They had trading relationships with the Romans and were culturally more compatible with them as opposed to other tribes in Italy. So why did Tarentum attack a Roman fleet? 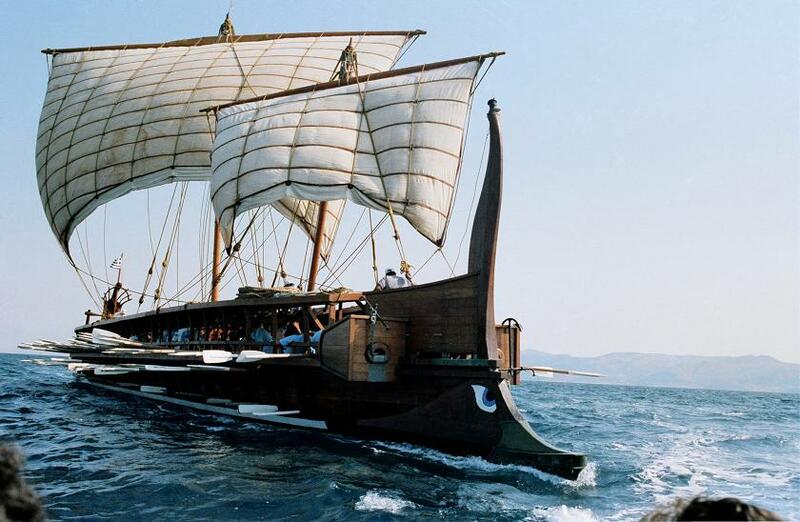 While the historians point to treaties that prohibited Roman warships from entering the waters of various southern Italian Greeks states, I strongly suspect that the Greeks knew that eventually they would have to fight Rome to attempt to maintain their independence. There are no boundaries in southern Italy that can be fortified. It must have been obvious to all that any group that was able to conquer northern and central Italy would do the same to southern Italy to achieve the cherished goal of secure land frontiers in Italy. After the naval assault by Tarentum, the Romans send an embassy. Who knows what really happened at this point. The historians claim that the embassy was insulted. This is probably nothing more than pro-Roman propaganda. Regardless, the result was that the Romans advanced an army into southern Italy and the Greeks appealed to Pyrrhus for military aid. This entry was posted in Ancient_History and tagged roman_republic, samnite_wars. Bookmark the permalink.